The consulate at Smyrna (as Izmir was called before 1930) was built and staffed by the Levant Company towards the end of the eighteenth century, when Smyrna was one of its most important factories. When the Company was wound up in 1825, its land was transferred to the British Crown, including two compounds. One, in the centre of town, contained the consul-general’s residence, offices, chapel, chaplain’s house and ancillary buildings: the other, to the north-west in the Alsancak port area, housed the hospital for sick mariners and its cemetery. 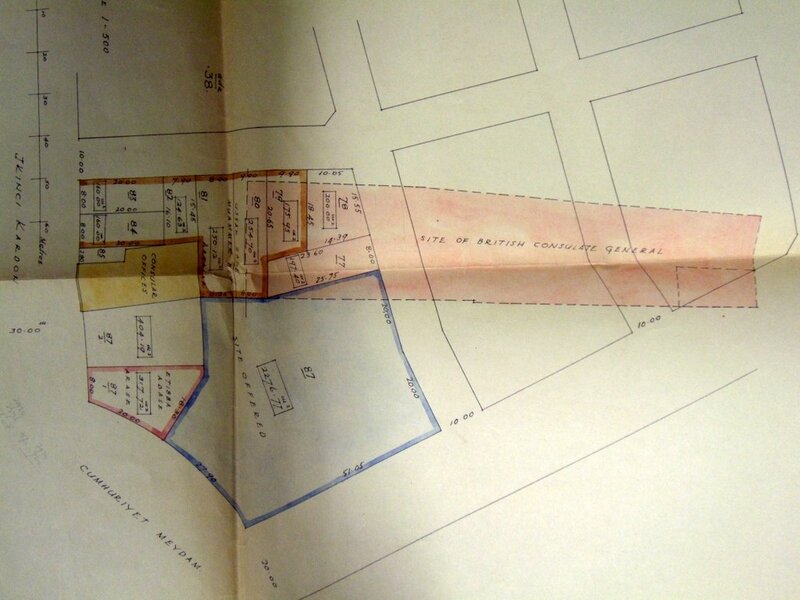 The consular compound was a long rectangular strip running between the quay and Frank Street, with the Austrian consulate as its southern neighbour. By the 1880s, the buildings had fallen into such disrepair as to be unfit for occupation. They were all rebuilt (excluding a chapel but including a post office) in 1892-3 at a cost of about £7,000, including £138 for furnishing a State reception room in the residence. The American consul-general took care of these buildings in 1916 for the duration of the war. Smyrna was occupied by the Greeks when they invaded Anatolia in early 1921. It was regained in September 1922 by the Turks, who promptly burned down almost the entire Christian quarter . 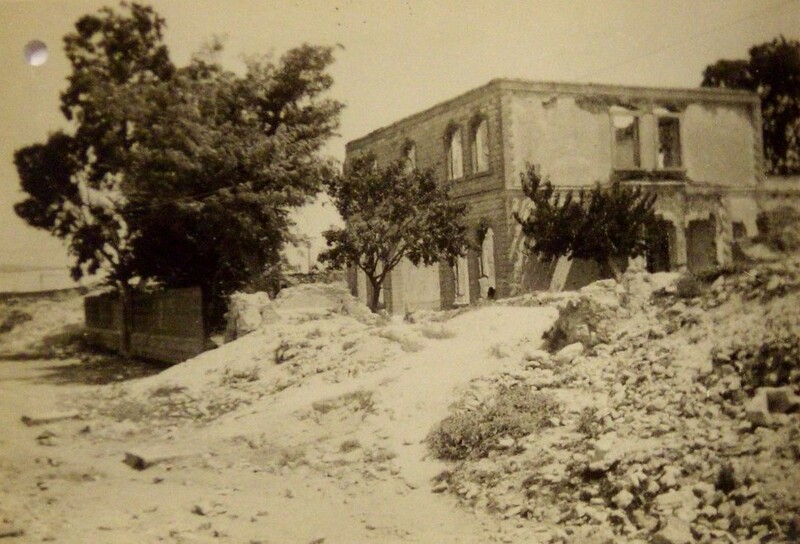 The consular buildings were devastated, though the prison and post office survived intact. The walls of the residence ruin were later demolished to one metre height and the damaged boundary walls were left to mark the boundary of the site. The consulate itself moved into leased premises at 47 İngiliz İskelesi. In 1936, the Turkish authorities, in the course of replanning the former Christian quarter, exchanged the former consular compound for a better shaped site of similar area (around 2,500 square metres), known as Plot No 87 at 38 Cumhuriyet Meydan, the new major crescent on the seafront. This site was never used or developed but for years could not be beneficially sold by the Office of Works because the proceeds would have gone into blocked accounts. This restriction was eased in the 1960s, when proceeds could be spent elsewhere in Turkey, and Plot No 87 was accordingly sold in 1969. The hospital buildings on the Alsancak compound inherited from the Levant Company were rebuilt in the 1850s. A new site for the hospital was bought nearby in 1895 and new buildings, including isolation wards and a surgeon’s house, were completed on it by 1897. This enabled the original hospital compound to be sold to the Anglican Church Building Society in 1898 for the construction of a new church. 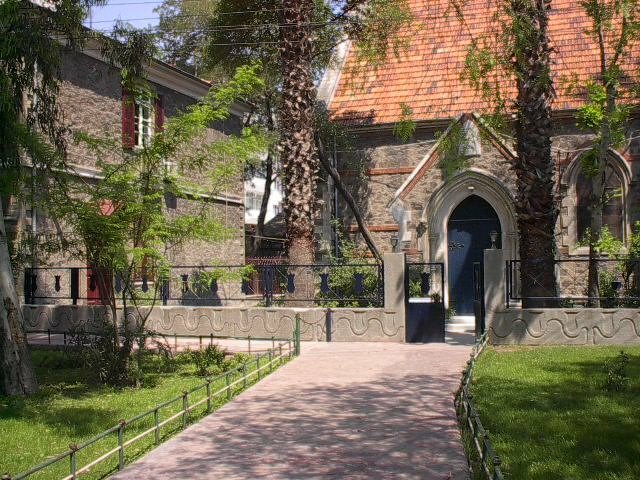 St. John the Evangelist was accordingly completed in 1899, consecrated in 1902 and remains in use at the north-east end of Talatpasa Boulevard. A vicarage was built next to the church in 1911. It has been leased as the consulate offices since the early 1980s. The nearby 1897 hospital ceased activity in 1923 (after which the surgeon’s house became the consul-general’s residence for a period), was sublet from 1925, and sold to the Turkish Red Crescent Society for £6,000 in 1935. It was later used as a school for deaf children, and is now a school for tourism: Anadolu (Nevvar Salih) Otel & Turizm School, on Ziya Gokalp Blvd. Original compound occupied by consulate until 1922. In 1936, the former compound (pink) was exchanged for a new one (blue). Consulate church (1899) and vicarage (1911), 2005.